The Providence River area has many small rocky islands or shoals that would cause problems for mariners in stormy weather. Lighthouses were built in this area to guide mariners around these rocky islands and shorelines. 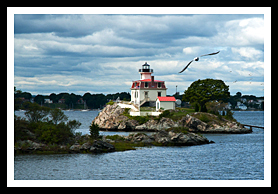 Conanicut Island divides Rhode Island’s Narragansett Bay into two channels, the East Passage and the West Passage. 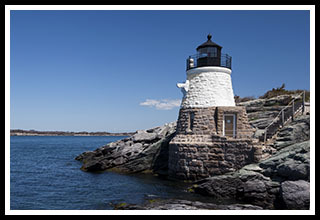 With so many dangerous ledges and islands along the Narragansett Bay area and with Rhode Island’s rocky coastline, lighthouses were built to guide mariners and shipping traffic from Newport up into Providence. Newport and Jamestown areas became places for the extremely rich who made their fortunes in the 19th century, many from the whaling industry, and many as part of the infamous Triangle Trade where African slaves were traded in the West Indies for sugar and molasses, which was used for rum in Newport. 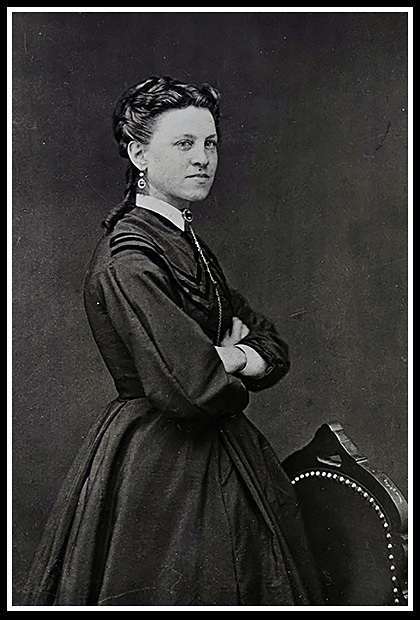 It was estimated at one time that one out of four people in Newport were making their living in some fashion from the sea. On Rhode Island's southeastern region, dangerous shoals would barley be visible in high tides or stormy weather, prompting the need the for a lighthouse to guide mariners along these dangerous shores. Note: The lighthouses mentioned below that you can drive to can also be viewed from various boat tours offered. 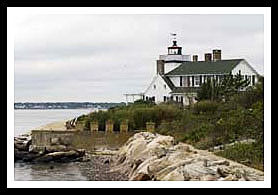 Rhode Island has a very diverse set of state parks and recreation for its many visitors and local communities to enjoy. For entertainment in theater, music, and dance, visit the Providence Performing Arts Center. The Museum of Natural History is the state’s only natural history museum, and the Roger Williams Park Zoo provides lots of family fun. For lots of hands on activities, visits Providence Children's Museum. The Providence Place Mall is a 3-story retail complex with over 170 stores. For the entertainment fans, the Dunkin Donuts Center provides lots of sports events, major concerts, trade shows and family shows. There is also the Blackstone River Bikeway, with 10 of the proposed 48 miles completed, you can take the completed bike path from nearby Central Falls, Lincoln, or Cumberland. When completed, it will connect to the East Bay Bike Path, and continue into Worcester Massachusetts. To get a view of Pomham Rocks lighthouse by boat, take the Rhode Island Public Transit Authority. You can also use the route to view some of the mansions at Newport from the water. 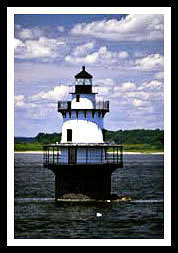 Access to Prudence Island to view the lighthouse is made by taking the Bristol - Prudence Island Ferry. 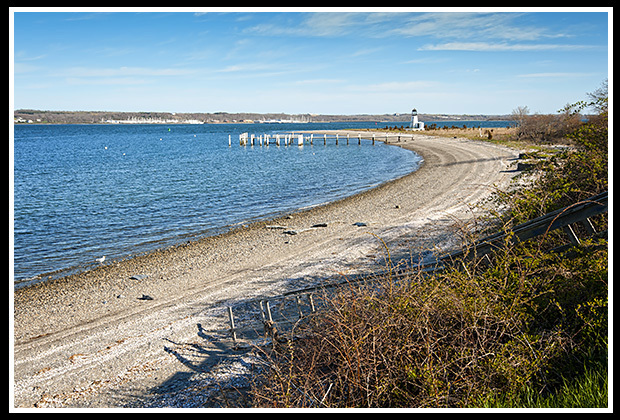 It’s a mile walk to Prudence Island (Sandy Point) Lighthouse there. 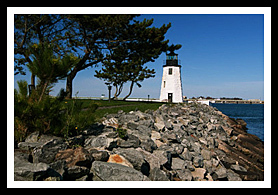 The 14-mile long East Bay Bicycle Path in East Providence, where the Pomham Rocks lighthouse is best viewed, runs along the Providence River, and is open to walkers as well as bikers. The Crescent Park Looff Carousel is one of the oldest and largest carousels with 62 beautifully carved and painted horses. 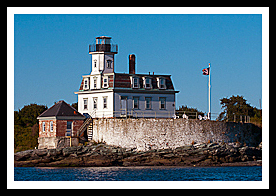 The Rose Island Lighthouse Foundation provides information on day trips or overnight stays at Rose Island Lighthouse in Newport. Newport is Rhode Island’s most popular tourist attraction including it’s most elaborate mansions of the rich and famous that shaped America’s 19th and 20th centuries. Newport provides plenty of concerts and events during the summer season. The Newport Cliff Walk is nearly 4 miles along an elevated path around the harbor, where you'll view some of the many mansions of Newport. 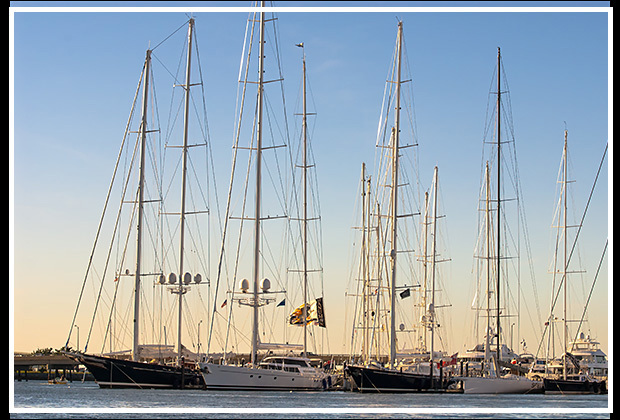 Other shoreline walks in Newport include the Newport Harbor Walk and the Ten Mile Ocean Drive. For wine tasters, there are also tours at the Newport Vineyards. 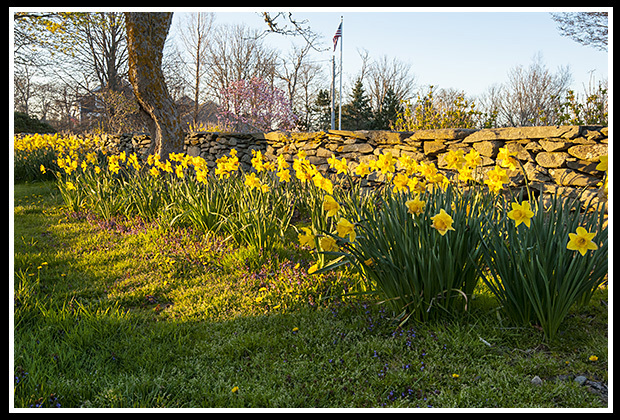 The ride down to Little Compton along route 77 is very scenic with country roads and attractive historic 19th century architecture along the way. Visitors will also find an interesting abundance of stonewalls marking properties as done in the 18th and 19th centuries. Visit Sakonnet Vineyards for local wine tasting and exploring. 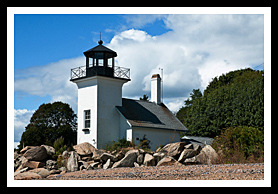 Sakonnet lighthouse can be viewed from the beach in the town of Little Compton, a very secluded seaside town. Offers weekly lighthouse tours in summer season. Lighthouses: Newport Harbor Light, Ida Lewis Light, Rose Island Light, and Castle Hill Light. The ferry provides access to and from the Prudence Island daily. From the ferry dock it's about a mile walk along the shore to Prundece island (Sandy Point) Light. 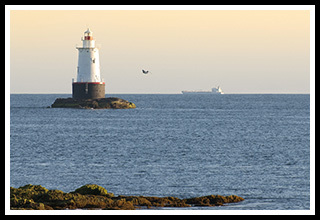 The Jamestown Newport Ferry offers scenic transportation on lower Narragansett Bay and in Newport Harbor and provides easy access for visiting a variety of destinations including stopovers at Rose Island Light during the summer months. 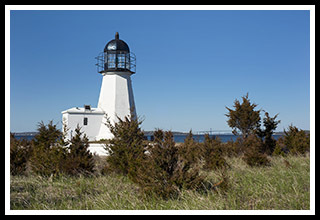 They also offer 2-hour narrated lighthouse tours on Saturdays and Sundays during the summer months, departing from Jamestown, RI. Lighthouses: Goat Island, Lime Rock, Castle Hill. Beavertail, and Rose Island. 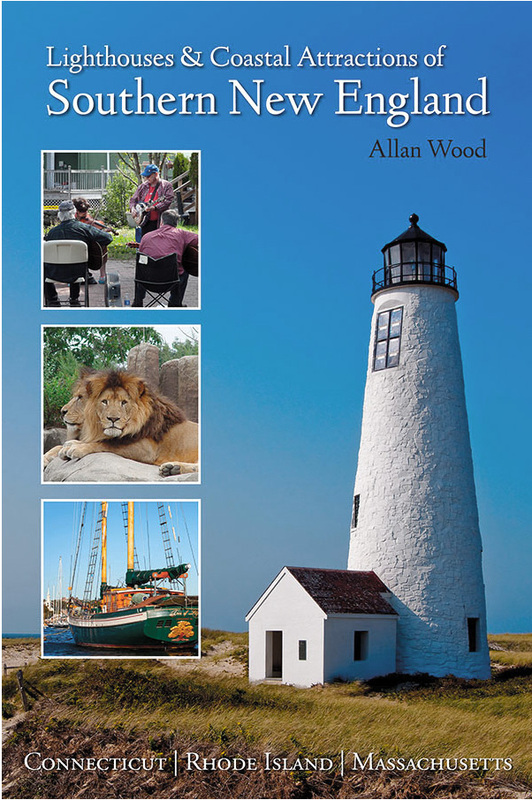 My book, Lighthouses and Coastal Attractions of Southern New England: Connecticut, Rhode Island, and Massachusetts, provides lots of special human interest stories from each of the 92 lighthouses, along with plenty of additional indoor and outdoor coastal attractions and tours in the area, with contact info to plan your trip. I'll be happy to sign it for you here, or you'll find it in any fine bookstore. In the book, with stories from each lighthouse, you'll find a few local special stories about Ida Lewis rescues and stories of heroism and destruction during the Hurricane of 1938.